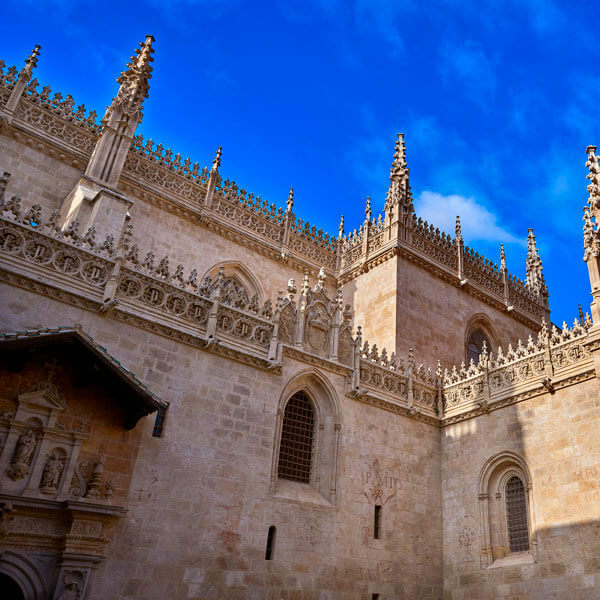 The Royal Chapel of Granada is a Gothic style building, constructed between 1506-1521 by the architect Enrique Egas. It is the burial place of the Catholic Monarchs, Queen Isabella of Castile and King Ferdinand of Aragon. The church contains a gallery of artworks and other objects related to the Catholic Monarchs. The tomb of the Isabella I of Castile and her husband, Ferdinad II of Aragon. It is a work by Domenico Fancelli. Another tomb of Joanna of Castile “the Mad” and her husband, Philip of Austria “the Handsome”. The most important parts inside the temple are the main fence, the mail altar and the crypt with the coffins. Inside the sacristy-museum is the legacy of the Catholic Monarchs: personal objects and the amazing collection of Flemish painters (Hans Memling, Vand der Weyden, Dierick Bouts). *** TIP: We do recommend our private tour to the Royal Chapel of Granada.